CAN ART BRING CLOSURE TO COMMUNITY TRAGEDY? I’m standing in a dimly lit gallery surrounded by large-framed dark black and white photographic images. A somber soundtrack plays echoing the mood of the visual imagery. From outside the sound of rain pelting down enters the space and mingles with the exhibition’s audio. Rain is a sound that may normally not present a concern, particularly in a country frequently in drought, however the exhibition before me represents the effect that significant rain and runoff can have on our communities. Just over twelve months ago, after days of torrential rain, the Burnett River at Bundaberg broke its banks submerging residential and commercial properties across the town. River cities historically deal with these events, however on this occasion the power of the river, and the duration of the flood, meant that after the water’s subsidence a significant area of urban space was obliterated. North Bundaberg suffered the most with houses washed off stumps, crashed into other homes and disappeared. What was left was utter devastation and a community dislocated, angry and in shock. The flood torrent had taken homes, belongings and also the sense of place and comfort that one feels in ‘being at home’. Over those days the town had its heart wrenched from its foundations. Recovery, rebuild and move-on are the common expectations that usually follow such calamities. Government agencies and support groups rally in an attempt to facilitate the renewal and regeneration. However underlying the good works there still lingers memories, emotions and an all pervading the sense of loss. 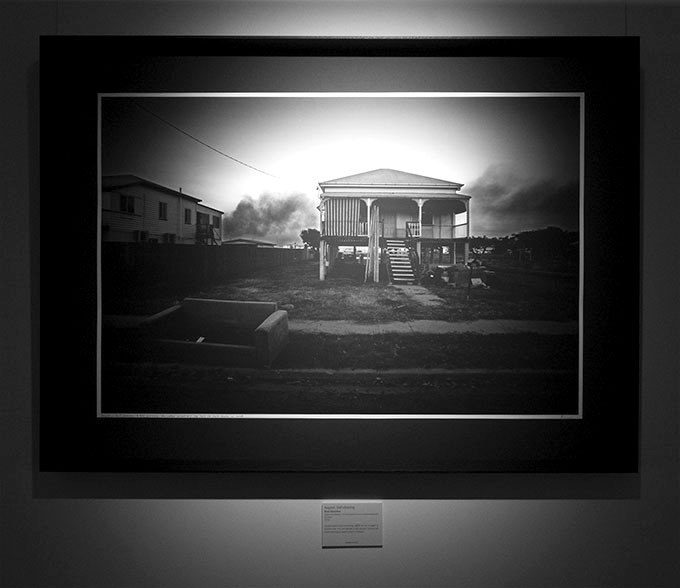 The exhibition Sunken Houses, at the Bundaberg Regional Art Gallery, is the public presentation of Marsellos’ commitment to his community and this documentary project. 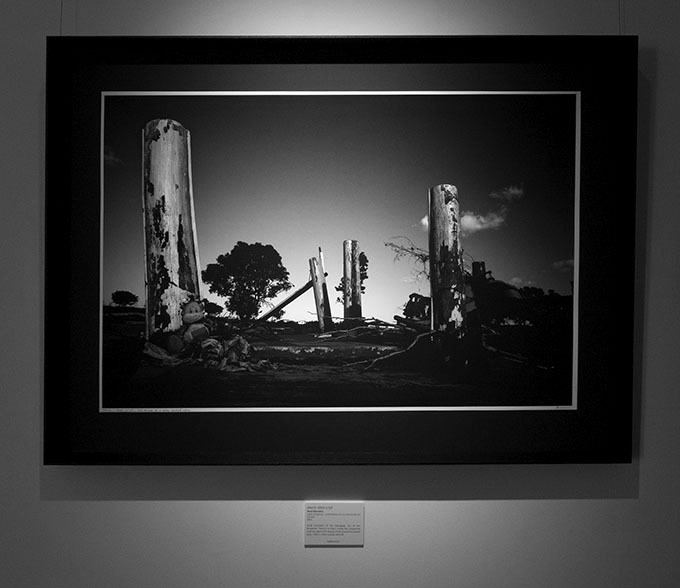 In the gallery large black and white photographs are presented in wide bordered black frames. The photographs capture a sense of impending doom through dark dramatic light, and often-stormy clouds. The curatorship and gallery craft involved in this show intentionally creates a space for contemplation of, and connection with, images of a community still in the shadow of the flood. All lighting in the gallery is subdued with the images spot lit creating islands of light. The accompanying soundtrack is described by the artists as ‘an immersive and emotive score’, and pervades the senses of the viewer. The composer was Heinz Riegler, a multidisciplinary artist who lives and works between Europe and Australia. 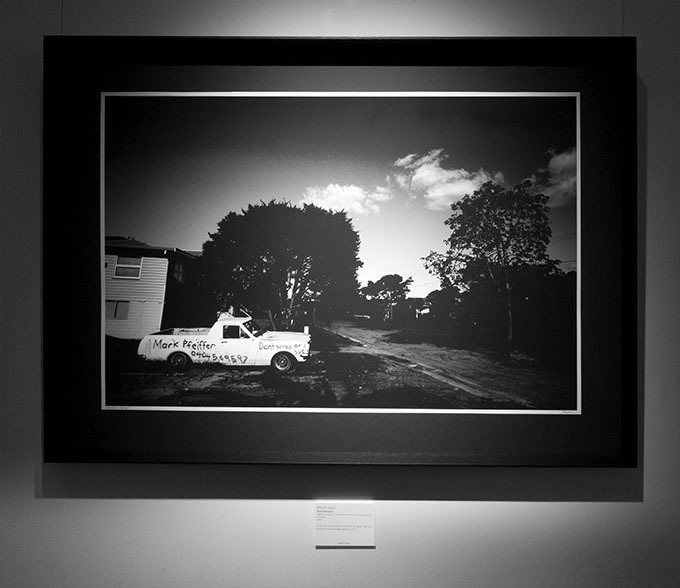 The musical score was designed by Riegler to not only compliment the photographs, but to also represent his personal response to the stories and emotions of the Bundaberg community. Harrowing photographs do not inevitably lose their power to shock. But they are not much help if the task is to understand. Narratives can make us understand. Photographs do something else: they haunt us. On their own these photographs may haunt and shock. Usually the viewer would leave the room taking with them the emotional state that was created in the gallery space. 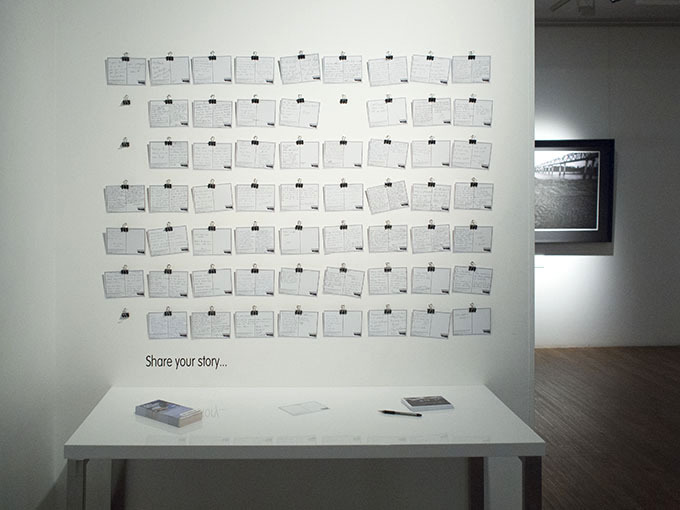 But this exhibition is different, there is a ‘message wall’ set aside in the gallery for visitors to tell their story – to express and share how they feel. Visitors either added to the wall or paused to read the cards and reflect upon the comments already posted. Perhaps this is evidence of the relevance that, ‘narratives can make us understand’, as Sontag suggests. While the curation of the images, space and the musical score drench the gallery with a sense of tragedy and loss, the ‘message wall’ gives a release to the emotive tension. The combinative effect then of the exhibition is to create an overpoweringly emotional cathartic experience. First proposed by Aristotle, later by others including Freud, catharsis is considered as a psychotherapeutic treatment. Aristotle defined catharsis as: ‘purging of the spirit of morbid and base ideas or emotions by witnessing the playing out of such emotions or ideas on stage.’[iii] An exhibition like Sunken Houses may re-connect the community with memories and their experience of the event and through that connection provide much needed emotional healing. 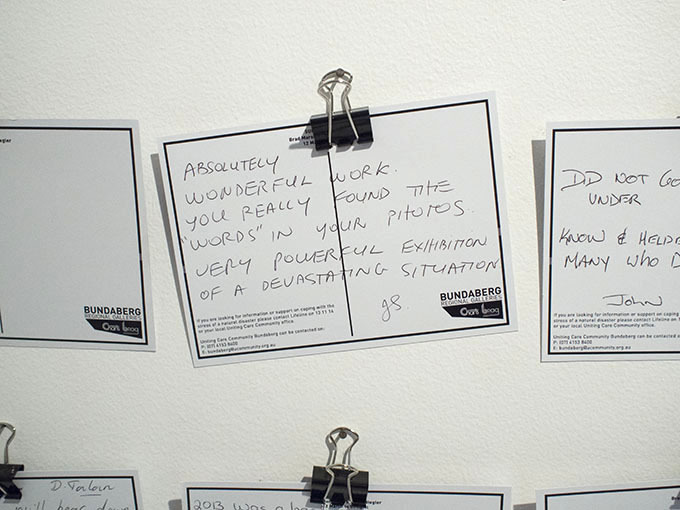 Does the exhibition then function in a cathartic way? 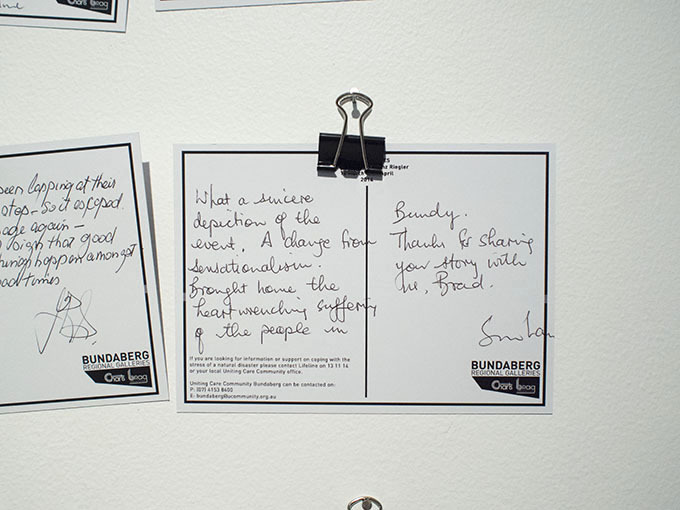 A Bundaberg News Mail report on April 16, 2014 published online, reported that the exhibition attendance had at that time broken all gallery records and stood at 2,500 visitors. 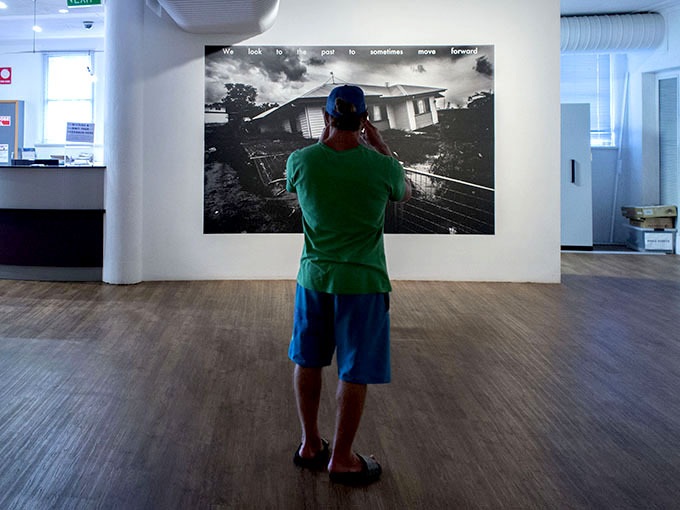 In the article Brad Marsellos made a number of comments relating to the response of locals and out-of-towners to the exhibition and their reaction to the show. At a time when it seems that the importance of art and artists in the community is being downgraded by government defunding of art agencies, grants and opportunities for art education, it is humbling to see the effect that art can have on the community such as this. 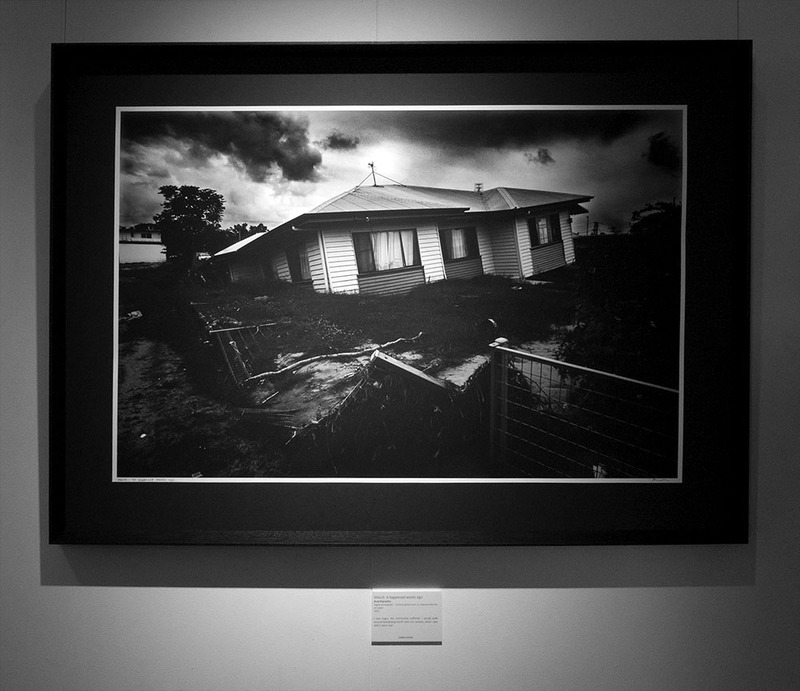 While the images may live on in the memories of those who witnessed the Bundaberg floods of 2013, the sensory experience of image and sound through the art of Marsellos and Riegler, will represent a compassionate and empathetic contribution – one that made a positive difference. [iv] NewsMail. (2014). 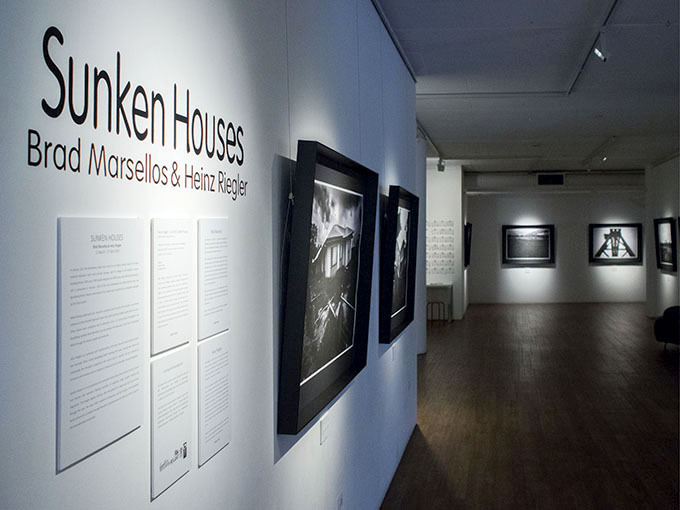 “Sunken Houses exhibition draws a crowd.” Online. 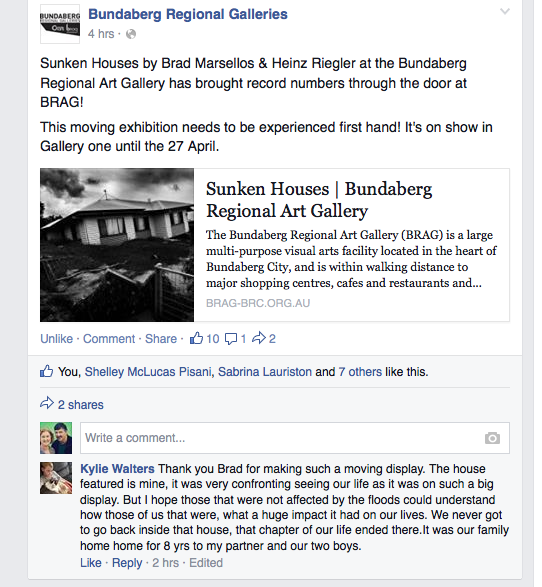 Retrieved April 16, 2014, 2014, from http://www.news-mail.com.au/news/sunken-houses-exhibition-draws-crowd/2231539/. Sunken Houses photographs © Brad Marsellos © soundtrack Heinz Reigler. My photographs and words are licensed under a Creative Commons Attribution-NonCommercial-NoDerivs 3.0 Unported License. Hey Doug thanks for this. Very moving. I used to live in Bundaberg – 84-95 where I was a Pastor [another lifetime ago!] and had little church on the Northside. I wonder if the lone cottage image might have been the church office on Hinkler Ave?? I know that the little chapel was washed away there. Take care. You do great work. Peter Breen. The cottage is on Hinkler Ave Peter, and yes, right near where the chapel once was. It may be the house you remember. If not, it is very close. Hinkler Ave was one of the worst affected streets. Houses there are still in a bad way. Thanks for this insightful look into Sunken Houses Doug. I visited today for the last time, the large crowd in the gallery was quite a surprise to me. As you say, the importance of artists and storytellers in our culture is vital.